My friend Kay got a Kindle for Christmas this year. Kay is the person who taunted me with tales of Tivo for at least 2-3 years before I ever even understood what it really was. She got her iPhone a year before I did and gave me iPhone lust. I, in turn, convinced her to come over from the dark side and get a Mac. We laugh about being geeks with our love of these electronic tools in our life. But Kindle???? I'm struggling with this one. I'm such a huge lover of books, I'm trying to figure out where my loyalties are. Mr. Sunflower has been on the periphery of paperless publishing for years and years, and I've not shared his enthusiasm for the concept. I feel crazy just reading off this computer screen for more than the time it takes me to do my business here each day. My favorite books (which I buy lots of) are those that have been in libraries or others' homes and have that well-loved feeling to them when I take them to bed at night. I am a child of Fahrenheit 451, and the daughter of a printer. I grew up around publishing...from melting the lead for the linotype machines to use to the huge presses that printed the final newspaper. I worked in the newspaper industry during the transition from hot type to cold. And now...plastic and an electronic screen??? Alas, the advantages are numerous, it would appear. I won't have to wait for books to arrive in the mail. It has a smaller carbon footprint, perhaps, because you're not using paper and the US mail service (although there are numbers I can't quote from memory about how much power it takes to keep all of us on line each day...this is no power-free ride) . I would no longer have to choose books instead of clothes when I pack for a trip. It might even keep me from being the woman found buried under her gazillion books one day. BUT... can I cuddle up with a hunk of plastic each night? have you tried it? how did you feel? I took the plunge and ordered my Kindle Monday. I'm like you a bit nervous about this purchase. Will I really like it or will I prefer books? A friend let me play with her's a that pushed me over the edge. Good luck with your decision. Face it: you are a geek at heart. Hi Martie: I'm with you - all the way - there is nothing like a good used/loved book to take to bed along side our DHs : ) goood luck with your decision !!! hey, where's your etsy store ?? there is a big blank spot on your sidebar ???? I've not gotten over missing out on your last wonderful blues - someone took them right out of my cart - WHAAAAAAA : ( can't wait for your next batch. Sandra: Hi! The shop's closed until I get back, I'm leaving tomorrow for a week. Ruthie: That's probably my stand right now, too. Maybe down the road, because I'm learning I always end up eating my words if I say never. Hmm, Kindle. I've been wondering as well. I keep thinking about how light and bulk-less it would be for hauling around. Someone...somewhere...(nothing quite like a fading memory) said the danger with e-books ends up being books lost if the battery hits empty. I have no idea if that is true or not, but something to check into if you hit the purchase stage. 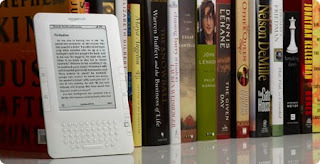 I hate to admit now after investigation, that the 6" kindle is quite attractive to me. I must say it has it's merits, but you can't pass the kindle books on to anyone, can you? After six hours of talking in the car today, I've learned more about the e-reader world. Will post tonight or tomorrow with updates. Very interesting.